Saints centre Rory Hutchinson has hailed Sam Vesty for bringing the best out of him. Vesty arrived as attack coach at Franklin's Gardens last summer and the tries have been flowing for Saints this season. They have scored 39 in their past four matches, with Hutchinson picking up man of the match awards in victories against Timisoara Saracens and, last Saturday, Newcastle Falcons. And the 23-year-old said: "I'm playing heads-up rugby. "Sam (Vesty) has been a massive help to my game and I'm enjoying playing at the moment. "I like the brand of rugby that we play so I'm really looking forward to the rest of the season. "So many teams go for kicking battles and miss opportunities. "A massive work-on for us is taking on those opportunities." Saints scored nine tries as they beat Newcastle 59-33 at the Gardens last Saturday. It set up a Premiership Rugby Cup final against Saracens in Northampton on March 17. And Hutchinson said: "It's brilliant to be in a final - it's my first one and it's at home so I'm really looking forward to that. "I'll hopefully be playing against my old school mate, (Saracens fly-half) Max Malins, so I'm looking forward to that." 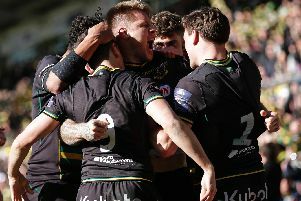 Saints roared back from 21-0 down against Newcastle. And Hutchinson, who was one of the architects of the success, said: "We needed something. We were really under the cosh at the start - it just wasn't us. "As soon as we got back into our process, the game started to work for us. When things click, it works well. "It's been a part of our season where we start slow so it's a massive work-on for us. "But we scored close to 60 points so it shows we can do it."